TOKYO (Aug 2): ANA Holdings Inc, Japan's biggest airline by revenue, on Wednesday said first-quarter operating profit rose 80% due to brisk business on international routes and after taking control of low-cost arm Peach Aviation Ltd.
Profit for the three months through June was 25.4 billion yen (US$229.3 million). That compared with an average estimate of 18.8 billion yen from two analysts surveyed by Thomson Reuters. 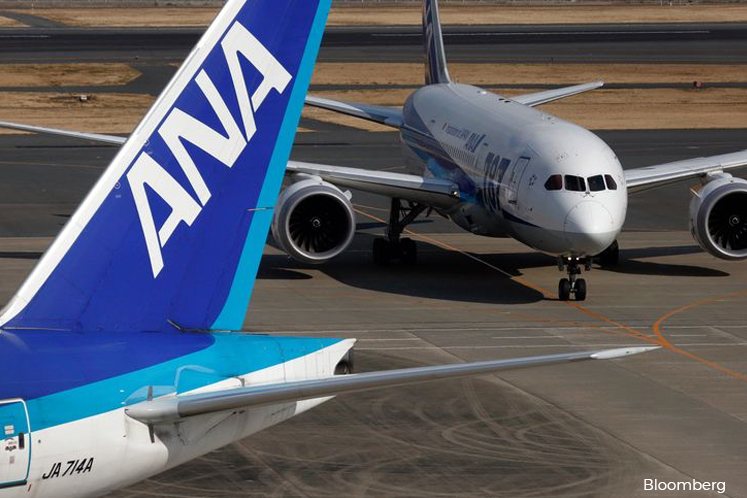 ANA maintained its forecast that operating profit would rise by 3.1% this year to 150 billion yen. ANA has taken advantage of restrictions placed by the government on Japan Airlines Co Ltd (JAL) after the former flag carrier's 2010 bankruptcy to expand its international network. The airline now wants to further boost international passenger and cargo revenue by 40% over the next three years in part by boosting its seat capacity through the addition of almost 70 aircraft to its fleet. International passenger sales in the first quarter grew 13.1% versus a year earlier boosted by increasing numbers of business travellers, Japanese tourists returning to Europe after a post-terrorist attack slump and Japan's growing status as a tourism destination. The international cargo business saw sales jump 31.3% due to strong demand for Japanese automotive parts in the United States and Europe and trade between China, other parts of Asia, Japan and the US. ANA is also pursuing growth through low-cost arms Vanilla Air Inc and Peach Aviation Ltd, recently taking a majority stake in the latter to cement its lead over Japan Airlines. JAL and Qantas Airways Ltd each own 33.3% of Jetstar Japan Co Ltd, Japan's biggest low-cost carrier, which is expanding its fleet after having recently become profitable. Japan was described by Jetstar Group Pty Ltd Chief Executive Jayne Hrdlicka as the airline's "biggest opportunity" at a conference in Sydney this week, saying the low-cost Japan market could grow to 30% from 10%, without giving a time frame.